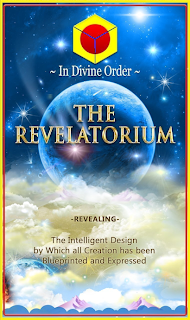 The UsuryFree Eye Opener: Introducing "The Revelatorium"
NOTE: The "Revelatorium" may be a difficult read. Start with the "introduction" and the "Preface" and then choose whatever "Starrgrams" or "Chapters" that appeal to you. I read Chapters 22, 23 & 24 first. The moment Mankind has been waiting for for over a millennium has finally arrived. The first tangible proof of off-planet life has at long last arrived. In nineteen ninety nine, a website called 'The Revelatorium' was launched. The website revealed many many aspects of the higher dimensions not previously known. By the fall of two thousand and thirteen the Revelatorium had morphed into a full revelation of the Intelligent Design by which all of Creation has been blueprinted and expressed. The verity of the Intelligent Design has now been proven in real time. The drawing below was done in the winter of two thousand and two as Figure 77 in Chapter 8 of the Revelatorium to depict the cubistic blueprint of the sixth dimension using the formats of the Intelligent design.. The image below of Saturn's North Pole by the Cassini probe launched in two thousand and nine, was taken on November 2013. If you carefully compare the two pictures you will see that they are structurally identical. Both have a clearly defined center area. The first hexagon shaped ring of pink patches around the center matches the ring of six different designs around the center of Figure 77. The second hexagon shaped ring of pink patches around the first ring matches the ring of twelve identical designs around the ring of six cubits of Figure 77. And finally, the third hexagon shaped ring of pale pink patches around the second ring matches the ring of eighteen identical designs around the ring of twelve cubits of Figure 77. The whole Intelligent Design is dirt simple and can be understood by anyone. The basic elements of the Intelligent Design consist solely of a sphere, a cube, and straight lines. The rules by which the elements work together hold the key. There is aught in existence not of the Design. The sphere represents Intelligence, the straight lines represent Energy, and the cube represents Substance. The attribute of the Father is Intelligence, the attribute of the Son is Energy, and the attribute of the Holy Ghost is Substance. Intelligence, Energy, and Substance is all there is. The 'Cube and Sphere of Alpha and Omega' and the 'Cubit' are the two most fundamental elements of the Design. The Cube and Sphere comprises the entirety of the fourteenth dimension, and acts as interface between the un-materialized inner form of the Creators in the fifteenth dimension as the Holy Trinity and above, and their materialized outer form in the thirteenth dimension and below as 'Creation'. The Cube and Sphere projected one dimension down to the thirteenth dimension comprises the 'Cubit'. The 'Cubit' is the basic genome of Creation. By principle of the Cubit the whole of Creation has been blueprinted and expressed. If you look again at Figure 77, you will see that it is composed entirely of variations upon the cubit. The various variations reflect specifically different frequencies according to rule. By the rule the differing frequencies comprise the differing parts of Creation. By this simple principle the Intelligent Design is sufficient to blueprint all of Creation in all of its aspects. The current Creation is over nine hundred trillion light years across and still within its infancy. What's Up - With UsuryFree Time Currencies? Usury Hell or UsuryFree Heaven?